32 oz press: 8-12 T (40-60 g). Apparently Knights Still Come in Shining Armor. The P7 is the king of all French presses, and the culmination of our efforts to design and engineer the ultimate way to make coffee and tea. Unlike traditional glass presses, the P7 is built like a tank. The vacuum-insulated, double-walled stainless steel won't break, keeps beverages toasty for hours, and looks beautiful. And under the hood you'll find ESPRO's patented double micro-filter, for the cleanest cup you can get. It's so much more advanced than any other press on the market that many customers tell us it's the last coffee maker they'll ever buy. At least they saved the best for last. Easy to Use. Add Coffee. Add your favorite specialty coffee. For the best flavors and aromas, grind just before brewing. Add Water. After boiling, let the water cool for 30 s before pouring. This is the best temperature for your beans. Fill the press with hot water, up to the line. The double walls keep the brew temperature consistent, for a precise flavor extraction. Stir & Brew. A gentle stir will make sure the grinds are broken up, so there is good contact for a full and even extraction. Cover and brew for 3-4 minutes. Press and Enjoy. The Espro double micro-filter filters the coffee twice, so only the aromas and tastes you love are in your cup. Don't push too hard, and if it does get tough, just lift the plunger up a bit and then continue pressing. Bundle comes with a Zonoz One-Tablespoon Plastic Clever Scoop and a Zonoz 8.25-Inch Wooden Stirring Spoon. 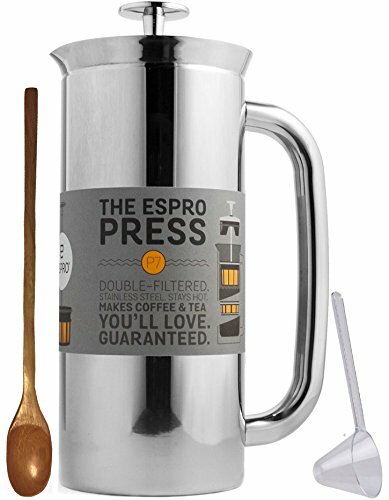 The ESPRO Press P7 is designed to make it easy for you to brew coffee you'll love. Unlike other presses, the patented double micro-filter gives you deep, rich flavor without any grit in your cup. 32 oz press serves 2-4 people; polished stainless steel; in retail packaging; BPA, BPS, and phthalate free. 1 x Zonoz One-Tablespoon Plastic Clever Scoop - 1 tablespoon plastic scoop has a 3-inch long, flat handle for easy use, and allows you to precisely measure out exactly enough freshly ground coffee to make the perfect cup. Get the best results out of your coffee fixes with the Zonoz clever 1 tablespoon scoop. Making measuring coffee easy. Insulated, double-walled stainless steel keeps your brew toasty for hours and won't ever break. 1 x Zonoz 8.25-Inch Wooden Stirring Spoon - Wooden 8.25" long stirring spoon: Included with this bundle is this Zonoz French Press Coffee Maker beautifully crafted wooden spoon.